When you’re hustling in the morning to leave your place and make it into work on time, breakfast is an easy thing to forget about. We don’t need to tell you that breakfast is important. You already know that and that’s why you’re here. The problem comes down to convenience. 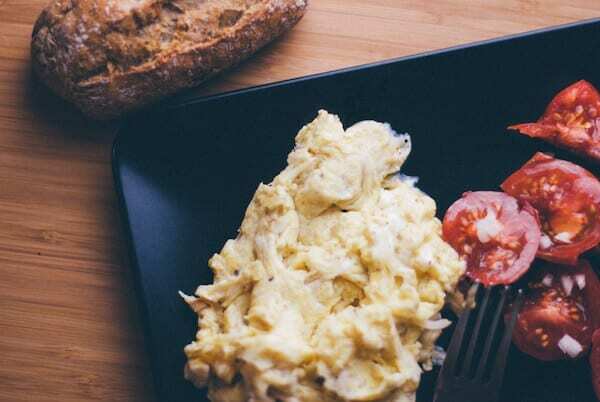 Very few people want to spend 30 minutes preparing breakfast each morning, so they end up just skipping it. 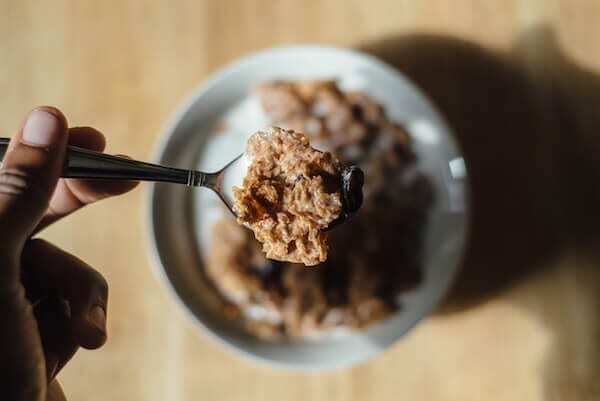 But there’s something worse than skipping breakfast – eating breakfast junk food like sugar-laden toaster pastries, danishes, or coffee drinks. Yes, not all breakfast foods are created equal. 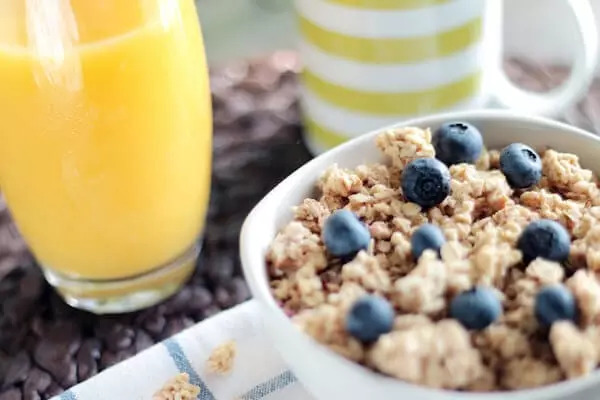 That’s why we’ve curated this handy guide with 39 healthy breakfast ideas for work that will help make your mornings magical. Many of these take just minutes to prepare. Others you can prep the night before so you can grab them on your way out the door. All of these are delicious, healthier options that will help you stay focused and productive at work. 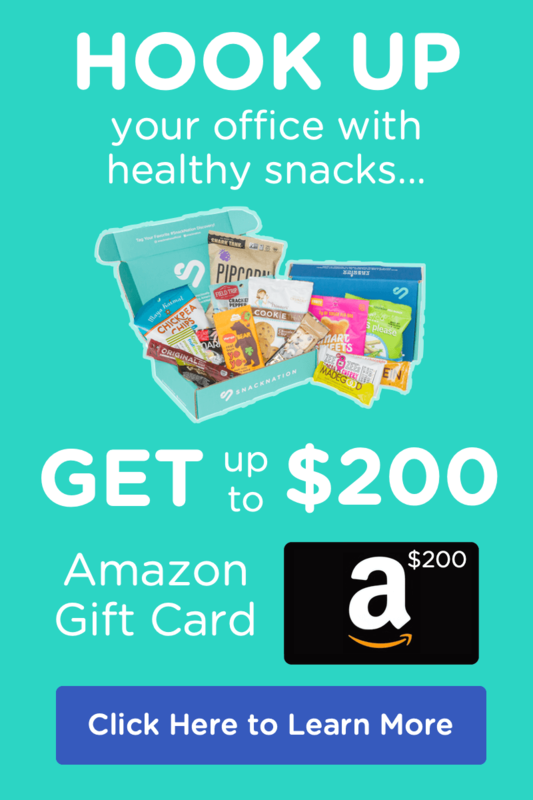 Get a big box of free healthy snacks for your office without lifting a finger. Special thanks to healthy food blogger Alexandria McInnes (aka @namasteslimmer) for lending her expertise. Avocado toast is so simple, you can make it in your office kitchen. The toast (make sure it’s whole wheat) gives you the complex carbs you need, and the avocado dishes out some great healthy fat. Not a fan of toast? Try baked whole wheat Methi Puri a delicious alternative from India. Toast a large piece of Gluten Free Super Seeded Multi Grain Bread. Add 1/4 cup of mashed avocado. Top with 1 sliced yellow cherry tomato. Add a splash of balsamic and chili flakes for heat. Photo and recipe courtesy of Stephanie Ivanick. As mentioned above, your brain runs on glucose. But the refined sugars found in foods like pastries will send you towards a mid-morning crash. What you want are complex carbs, and this simple, delicious breakfast has them in spades. Mix 1.5 Tbsp. coconut sugar with 1 teaspoon cinnamon. Mix together. Smooth a thin layer of coconut oil over grapefruit and sprinkle with cinnamon mixture. 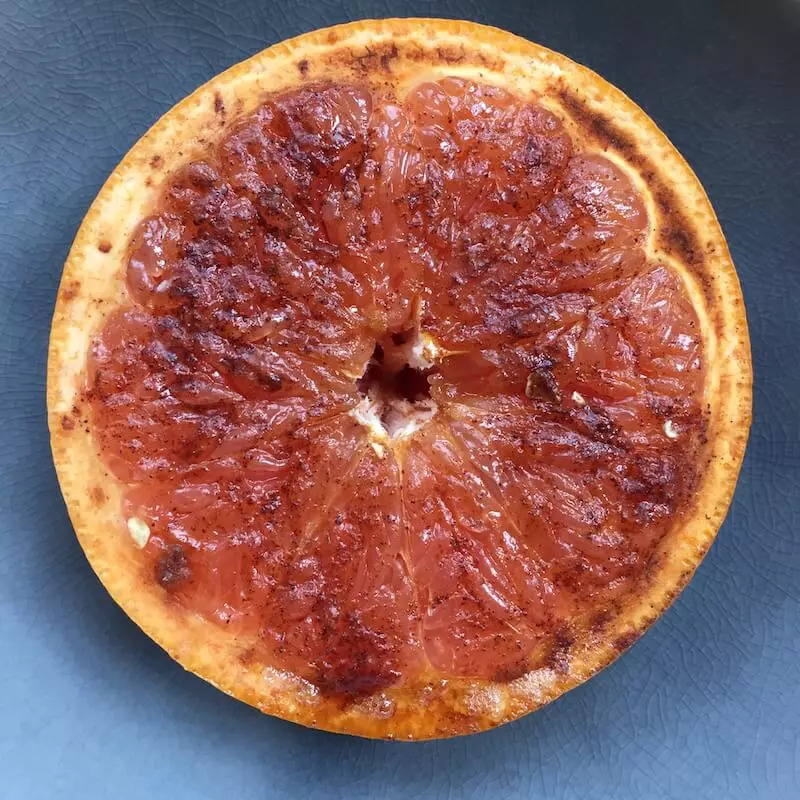 Place grapefruit on foil lined baking sheet and broil for 2 – 3 minutes until sugar is bubbling. Enjoy! No preparation required for this delicious grab and go breakfast snack created by husband and wife team Paula and Andy Hannagan. Bounce Balls are 100% natural, gluten and GMO free, and contain up to 9 grams of protein. Try these and you’ll see why their motto is eat good, feel good, do good. Flavors include superberry, cacao mint, coconut and macadamia, and peanut cacao. 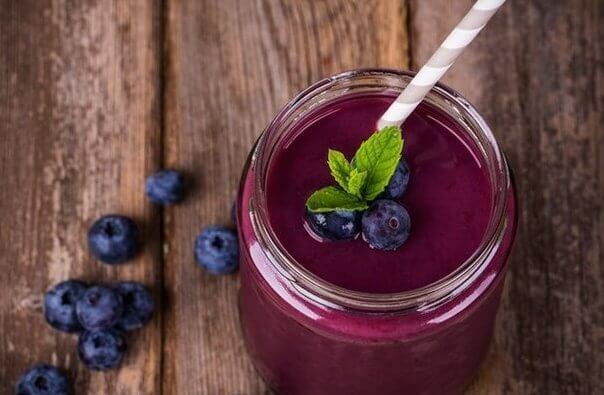 Smoothies are a great way to get all the nutrients you need in the morning in one go. Prep this sweet and creamy concoction the night before so you can hit the blender before you hit the ground running in the a.m. The protein-rich hemp seeds also make this a great post-workout drink. 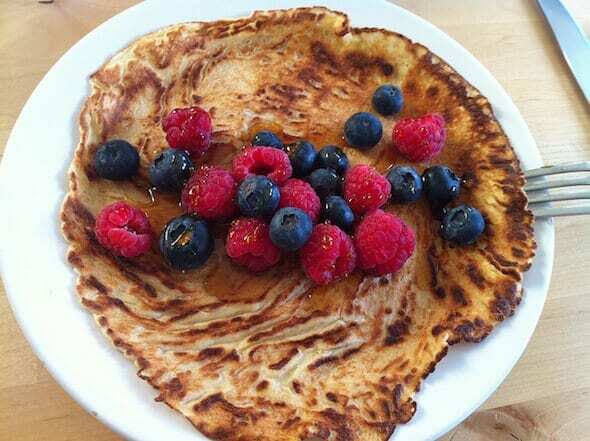 Check out Deliciously Ella for the full recipe. This antioxidant-rich treat is all about the berries. It starts with a foundation of berry smoothie, followed by a layer chia seed pudding, and topped with more fruit, granola, and delicious Dang coconut chips. This one’s a little extra work, but it’s well worth it. Check out the full recipe from blogger Joleen Cuisine. This is another great recipe to make the night before, so you can just grab on your way out the door. Buckwheat definitely deserves the “superfood” status. It’s a cheap, versatile, and gluten-free source of protein. It’s also iron rich and known to reduce lipid levels in the blood, which is great for your heart. Deliciously Ella has the full recipe. 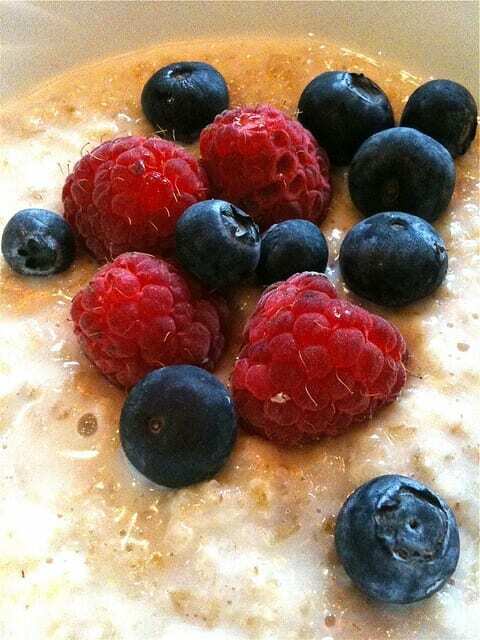 Muesli is based on raw rolled oats, making it a great source of complex carbs. Unsweetened cocoa powder and protein-rich sliced almonds and pepitas mean that this decadent tasting breakfast is actually good for you. Add milk (or your favorite non-dairy milk) and enjoy! Who knew that the pottery that grows was really a world-class superfood in disguise? 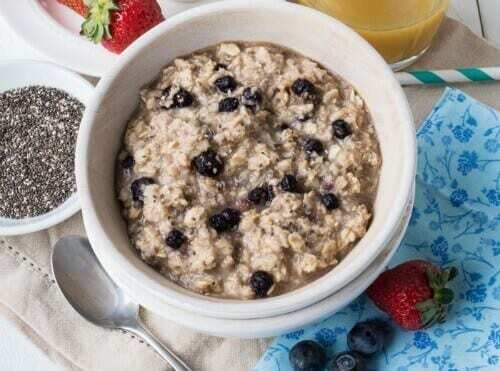 Chia seeds are whole grain, and therefore a great alternative to processed grains. 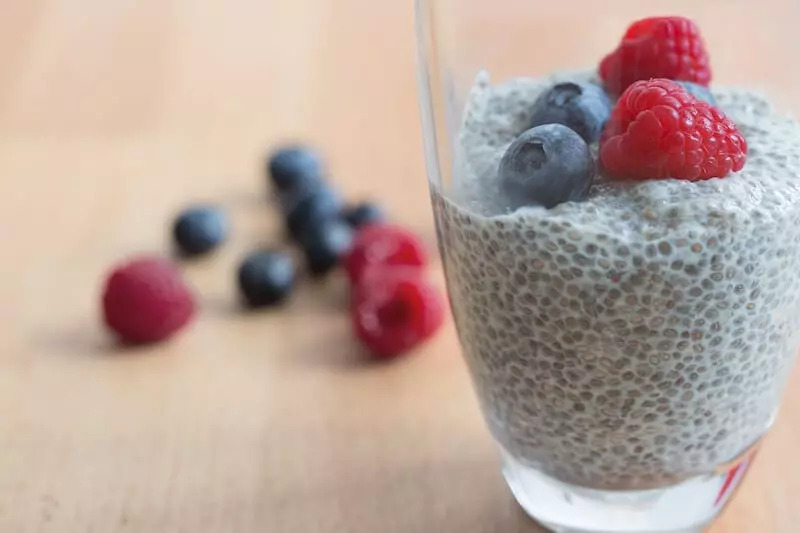 Chia seeds and coconut milk make for a Paleo-friendly pairing in this satisfying breakfast treat high in anti-inflammatory omega-3s. This is another recipe you can make the night before to save yourself time in the morning. Mix chia seeds, coconut milk, and honey together in a small bowl or glass. Let it set in refrigerator overnight. Remove from the fridge, and make sure your pudding looks thick and the chia seeds have gelled. Top with fresh fruit and nuts, and enjoy immediately. Fill Earnest Eats Superfood Blueberry Chia Hot & Fit Cereal Cup with almond milk (or your choice milk) just enough to cover the grains. Cover cup and store in fridge overnight. 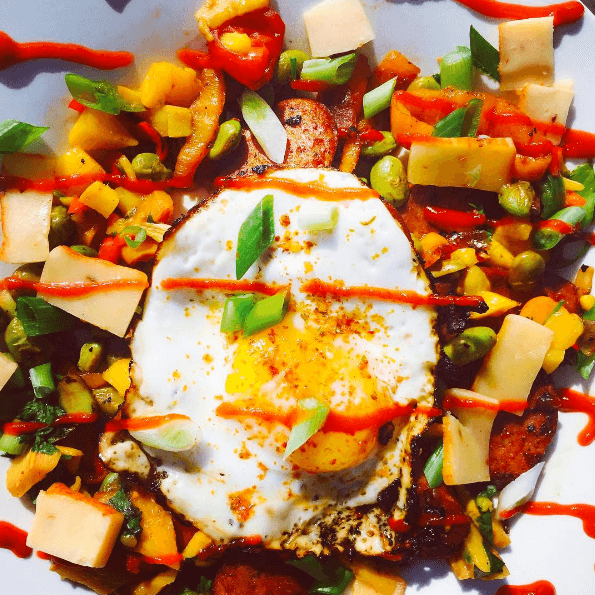 Earnest Eats provides another gem with this baked breakfast goodness. Combine first 6 ingredients in a large bowl, then whisk together eggs, milk and oil in a small bowl. Fold wet ingredients into dry ingredients until evenly blended. Pour into a lightly greased 9×5 bread loaf pan and bake for 20-22 minutes until set. 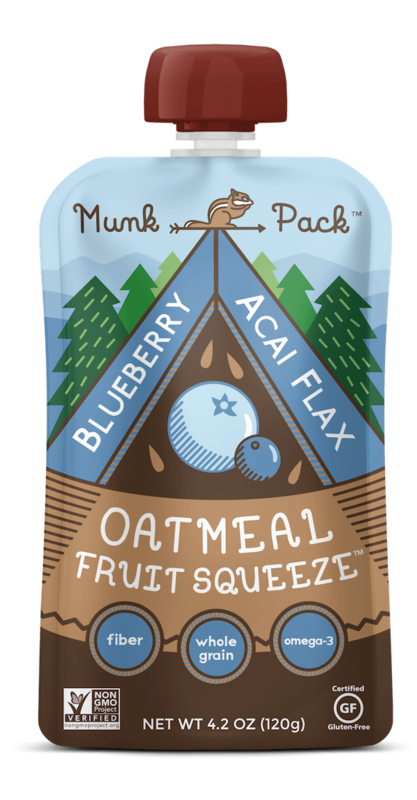 Another great quick and healthy option, Munk Packs power your mornings with clean energy form hearty oatmeal and real fruit. 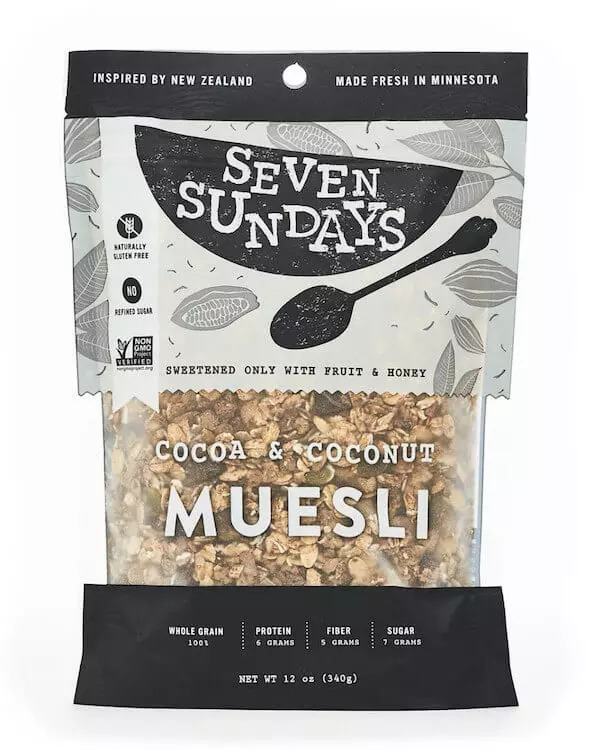 Munk Packs are minimally processed, and free of the sugars and fillers you find in most breakfast bars and snacks. Their convenient pouch packaging means you can eat on the go as well. I’ll admit it, I LOVE donuts. I just don’t love the way they make me feel afterward, nor am I crazy about the effect they have on my mood and mental state. These Paleo Carrot Cake Donuts provide all the decadence of a traditional donut, without the crash (or the guilt). 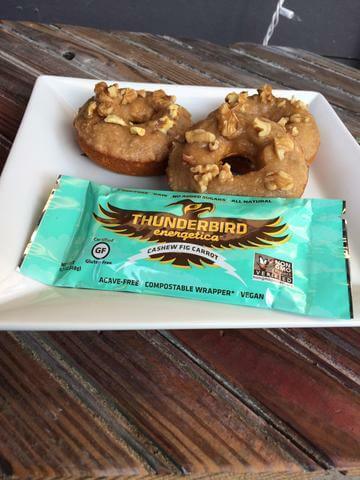 This one comes from Thunderbird Bars, the Austin-based makers of pure, clean, and sugar free energy bars. 6 Tbsp. 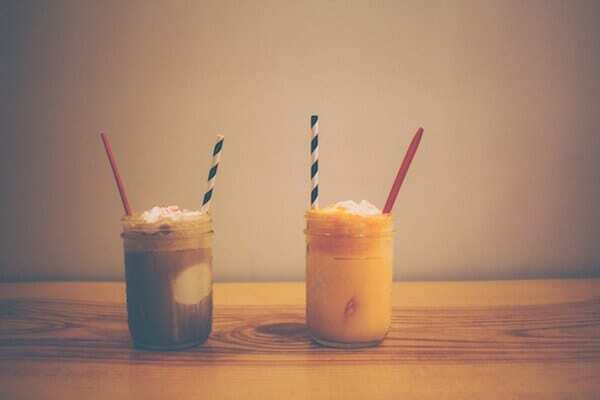 honey or maple syrup. Sift all dry ingredients together in one bowl, and combine all wet ingredients in another. Add the wet ingredients to the dry, mix thoroughly, and then fold in the shredded carrots and figs. Pour batter into donut mold (fill each mold 3/4 full). Bake for 18-20 minutes or until donuts are golden and a toothpick comes out clean. Remove from oven and allow to completely cool before frosting. 2 Tbsp. water to thin, if necessary. Process all ingredients in a food processor or high-powered blender. Once donuts are cool, dip each one into frosting and return to cooling rack to let frosting set. Top each donut with crushed walnuts and shredded coconut, if desired. Makes eight donuts. 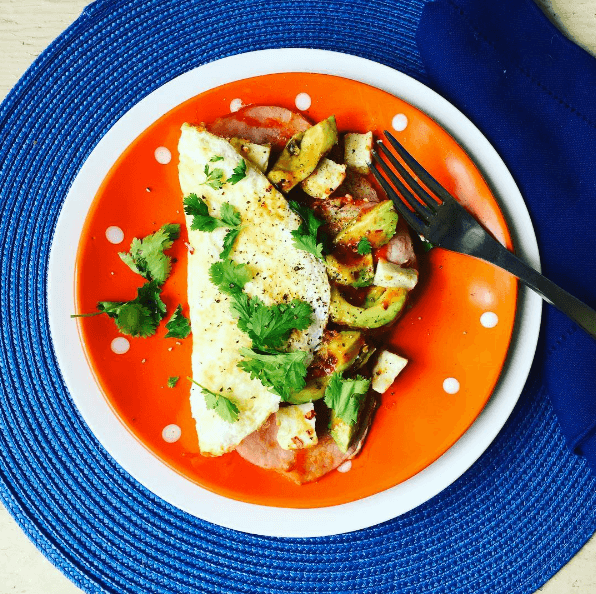 Here’s another quick recipe from Namasteslimmer’s Alex McInnes that you can prepare in a pinch. 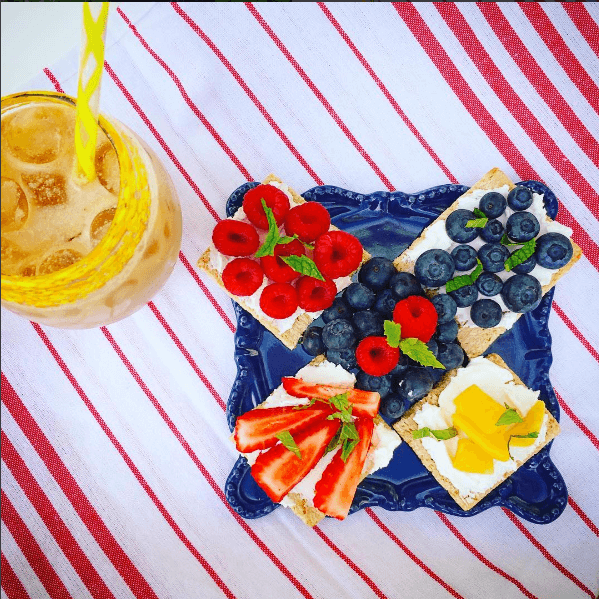 Take 4 Wasa Crisp’n Light 7 Grain Crackers, and top with 2 tbsp Honey Goat Cheese, and finish with sliced strawberries, mango, or blueberries. Easy, delicious, and very nutritious. This nutritious and satisfying treat is as simple as it gets. Take 6 oz of nonfat plain Greek Yogurt and top with strawberries, blueberries, raspberries, and kiwi. Sprinkle in 1 tsp of Health Warrior black chia seeds and Justin’s Honey Peanut Butter Blend. Bam! Breakfast bliss in a bowl. A lighter take on a traditional favorite. This one’s quick and easy too: 1 Egg Beaters SmartCup, 3 Slices of Hormel Foods Thick Cut Canadian Bacon, 1 wedge cut up of Laughing Cow Swiss Garlic Herb Cheese, 1 mini avocado. Add a hot sauce drizzle and sprinkle of cilantro and pepper for added kick. 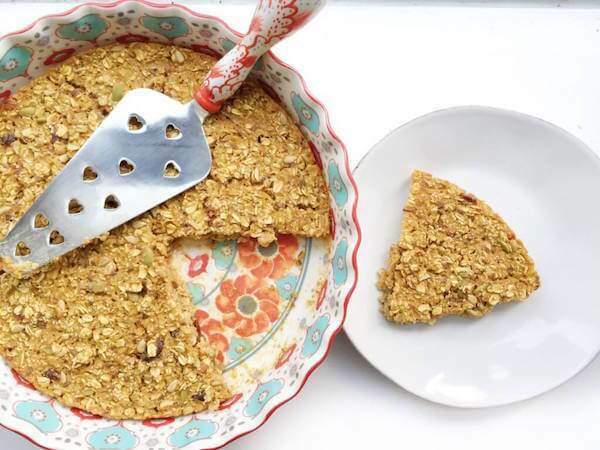 This richly satisfying breakfast treat is great for on the go eating. Heat one Trader Joe’s whole wheat waffle in toaster. Cover with smooth peanut or almond butter and top with your choice of fruit. Banana is a great compliment to the nutty butter. Also, be sure to try this other fun waffle recipe for your next breakfast. 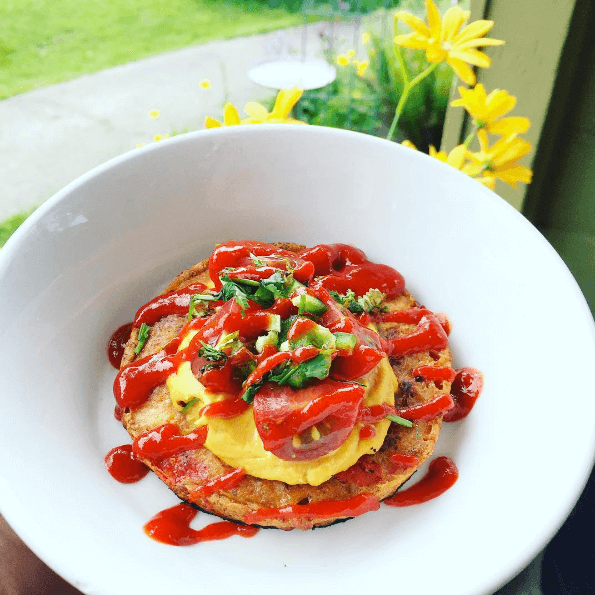 If you associate breakfast burritos with greasy spoon diners and massive food comas, you haven’t tried this healthy version made for endurance athletes. The sweet potatoes taste great and are packed with nutrients. Bonus – these burritos are freezer friendly. 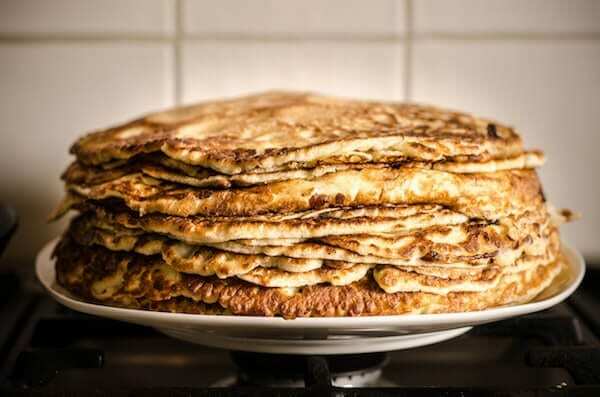 Make them in batches and you’ve got breakfast for the entire week. Full recipe at Endurance Zone. The best thing about this quick dish is that while it’s easy to make, it looks like it was hard to make. A great way to impress your friends during the autumn and winter months. Delicious Ella has the full recipe here. Sweet creaminess and crunch that will trick you into thinking you’re indulging – when you’re really not! This little dish has plant protein, omega 3 acids, vitamins and wonderful fibre filled complex carbohydrates for days. Feel full, satisfied, and bursting with energy. Full recipe over at Deliciously Ella. This fresh, energizing remix of the classic pancake is packed with whole grains and complex carbs. This amazing breakfast is easy enough to whip up in the office kitchen. Load up your mug up with fresh strawberries. Soak a piece of Gluten Free Bread in a mixture of egg (one), a splash of Oganic Valley French Vanilla Half & Half, vanilla extract, and cinnamon. Cut up the soaked bread on top of the strawberries in mug. Microwave for 2 minutes 30 seconds. No need for syrup, the strawberries provide all the sweet goodness you’ll need. This EGGcellent breakfast is packed with protein – and flavor. Combine 1 Aidell’s Organic Smoked Chicken Sausage, diced Shallots, Peppers, 1/8 Cup Trader Joe’s Shelled Edamame, 1/2 oz sliced Spicy Gouda, and leftover Mango pico de gallo in a pan and sautee. Top with fried egg and drizzle with Sriracha for extra oomf. Combine 1/2 cup quinoa mixed with 1 Tbsp. Organic Valley French Vanilla Half & Half. Top with 1 Tbsp. shredded sweetened coconut, mixed berries, kumquats, and kiwi. Voila! Photo and recipe courtesy of @namasteslimmer. 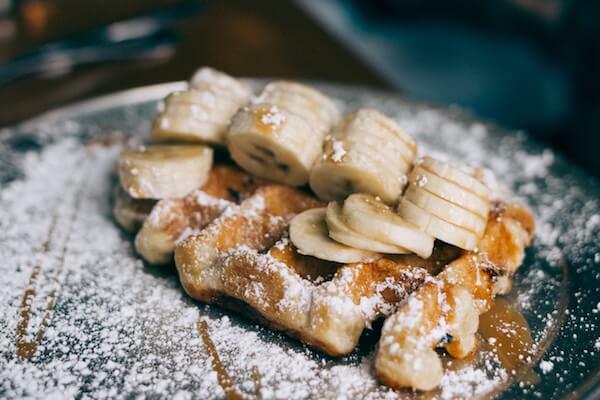 These waffles made out of chickpea, buckwheat, and tapioca flour, are 100% gluten free and packed with protein, making them a healthier, satisfying waffle choice. First off, no, you won’t be stumbling into work with this one. The alcohol will burn off, but the coconut rum flavor will remain. All in, this takes about 35 minutes to prepare and cook. Makes 3 cups. Recipe at The Baking Noob. Ok, this one might sound a bit weird, but hear me out. Not only does this taste amazing, but you get complex carbs and a heaping dose of protein. Plus it only takes about five minutes to prepare. 1 tsp. of toasted pumpkin seeds, salt and pepper, cucumber and greens of your choice. Full recipe at Very Breakfast. 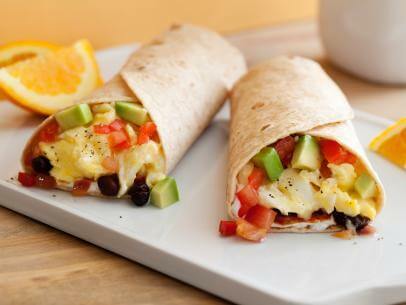 This flavorful delight only takes about 15 minutes, making it perfect for those mornings when you’re running behind. 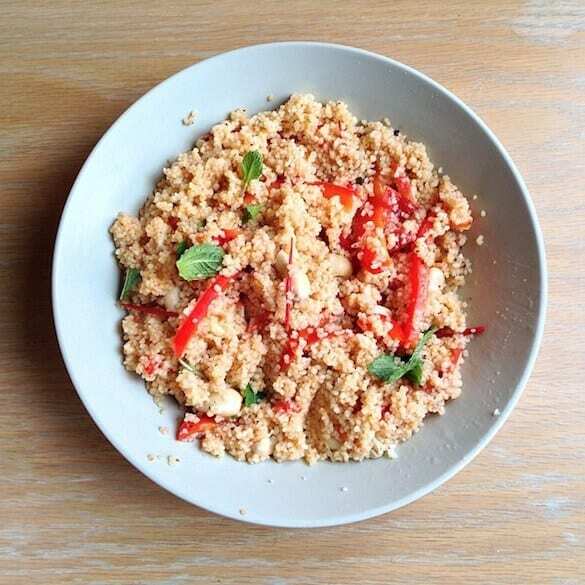 Another great way to repurpose your leftover couscous. Combine with honey, yogurt, raisins to give this pasta breakfast makeover. 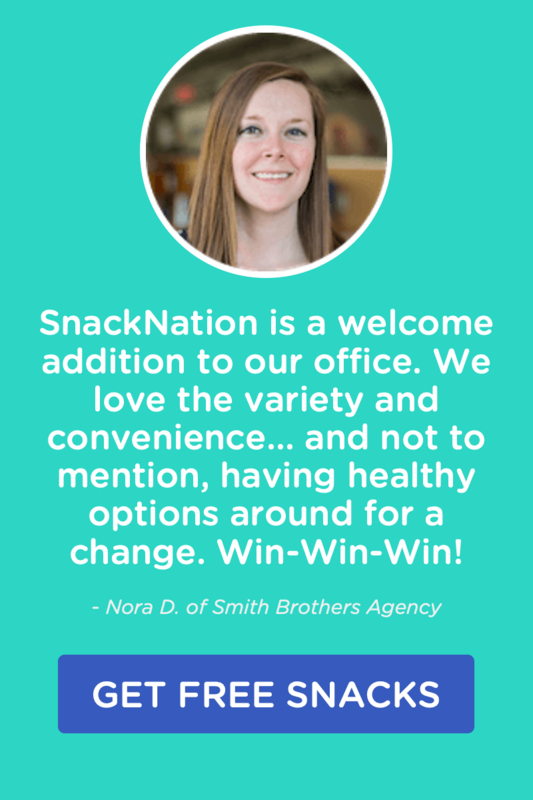 You know we fancy over here at SnackNation. 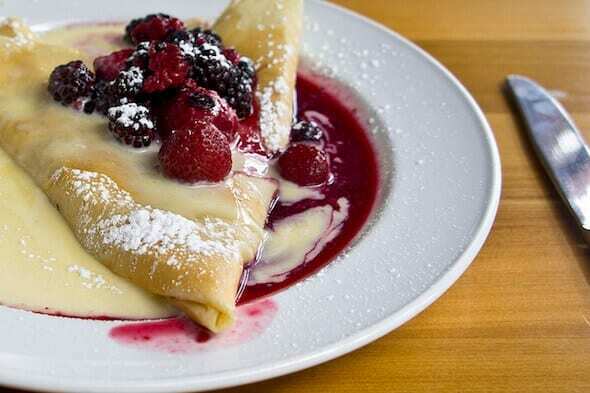 Every once in a while, we like to get our crepe on. 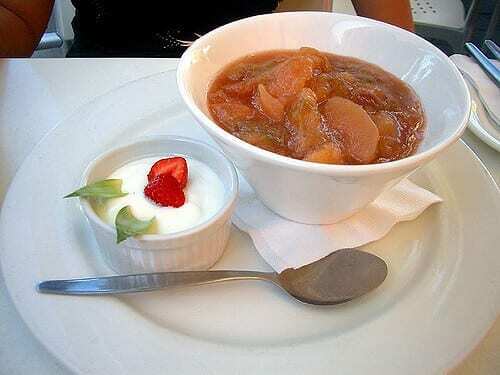 Here’s a healthier recipe for all you francophiles out there. Full recipe at The Baking Noob. I like this one, not just because green is our company color, but because the tropical flavors makes me feel like I’m vacation on a beach somewhere. Place all ingredients in a blender or food processor and mix until smooth. 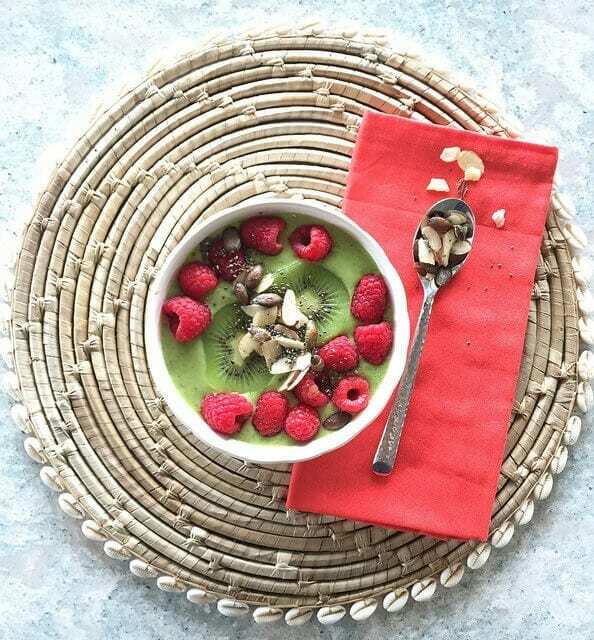 Top with kiwi slices, shredded coconut, or chia seeds and enjoy! Substitute rice flour for the base of these healthier muffins. They’re big, so consider cutting in half. 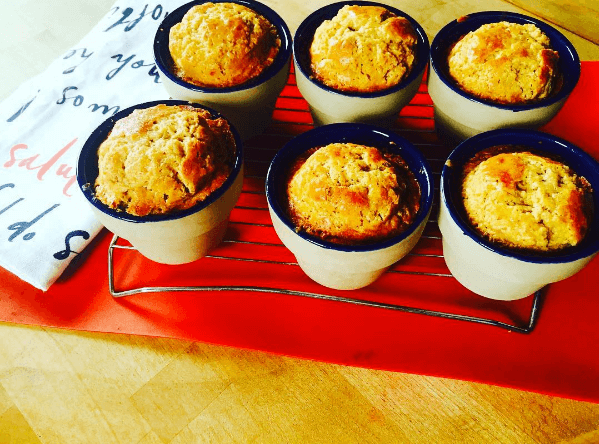 Got some of those stale gluten free banana muffins hanging around? Repurpose them in this brilliant dish from Alex McInnes. Take 1 chopped banana muffin, spray with coconut oil spray and bak at 350 for 20 minutes. Panzanella created with 2 tbsp Sugar Free Chai Mix and equal parts skim milk. Top with Nectarines, Kiwi, and Blueberries. Add in two Tbsp. 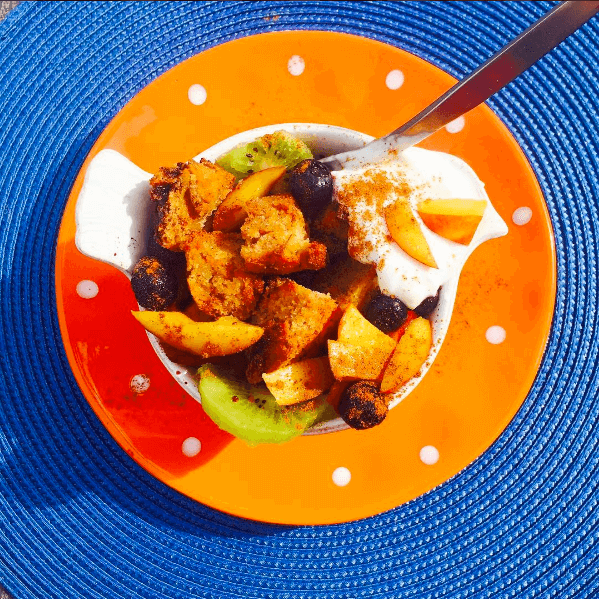 Pinapple Greek Yogurt and dusting of cinnamon. This one is vegetarian, delicious, and loaded with high quality protein. Scramble 1 boca burger patty with 1 tbsp. Lentil Curry Hummus. Add in Sriracha, jalapeño, and tomato for a heat kick. 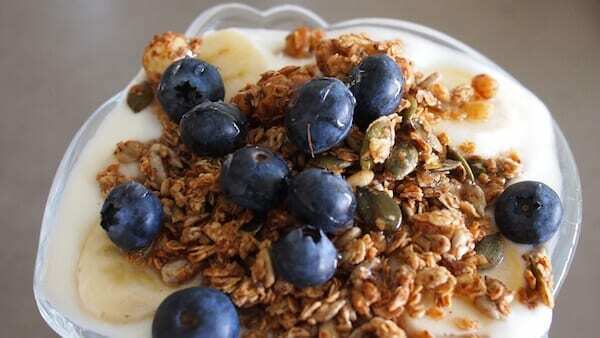 This recipe starts with Quaker Real Medleys SuperGrains Granola, a delicious blend of seven super grains, seeds, fruits & nuts which provides fiber, ALA omega-3 and whole grains. Full recipe over at Xoxobella. Post’s granola is lovingly crafted from whole grain rolled oats, honey roasted peanuts, soy nuts, roasted chickpeas, dried cranberries, almonds, and pumpkin seeds. 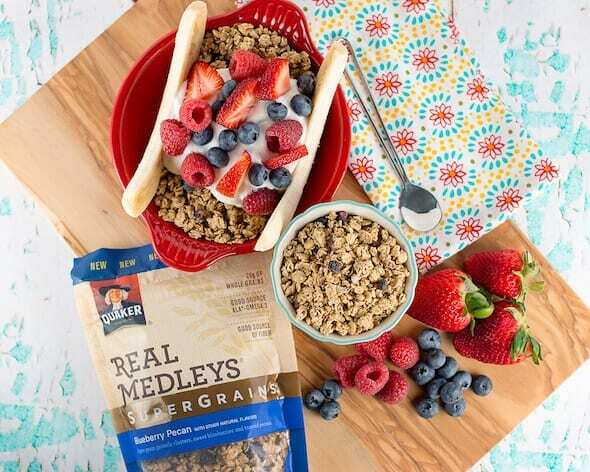 What’s more – instead of artificial sweeteners, the folks at Great Grains gently crack the whole wheat berry and add a mix of grains to give their flakes a naturally hearty flavor, then add fruits and nuts for added sweetness. The finished product is crispy, tasty, and less processed whole grain cereal, and every serving contains 9g of protein and 4g fiber. Spray your pie dish with cooking spray. Pour oat mixture onto greased pie dish. Bake in the oven for about 35-40 minutes or until the top of the oatmeal looks golden and crispy. Let it cool for a few moments and serve while still warm. 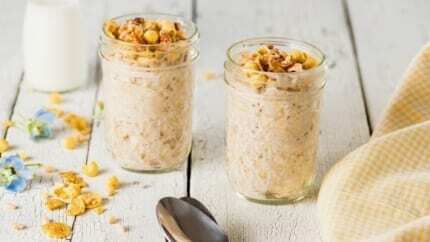 Another overnight oats recipe. And why not? It’s easy, delicious, and best of all, great for you. Combine oats, almond milk, honey and cinnamon; cover and refrigerate overnight. Stir mashed bananas into oats mixture; spoon into bowls. 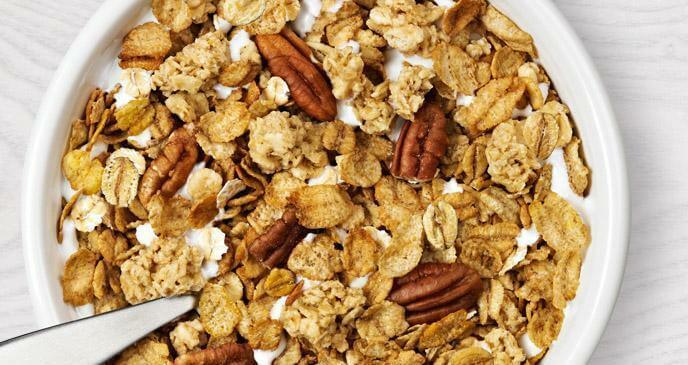 Toss granola with walnuts; sprinkle over top. 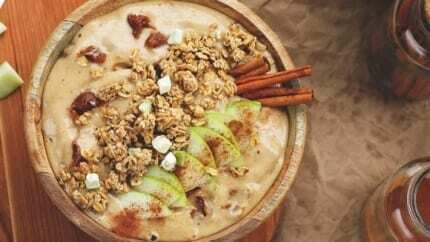 Nature’s path has a great recipe for a caramel apple themed smoothie bowl. It only takes about 10 minutes, so you can make it before you head to the office or on your morning break. In a food processor, combine dates and coconut oil. Process until smooth, using a spatula to pull the date mixture away from the sides as needed. Once smooth, add the coconut milk and maple syrup. Transfer to an air tight food storage container. Serve the banana smoothie base in a bowl and top with small spoonfuls of date caramel. Gently stir the dollops of date caramel into the smoothie. Top with thin sliced apples, cinnamon, and Love Crunch Apple Chia Crumble Granola. Eat with a spoon (or your fingers, we won’t judge). 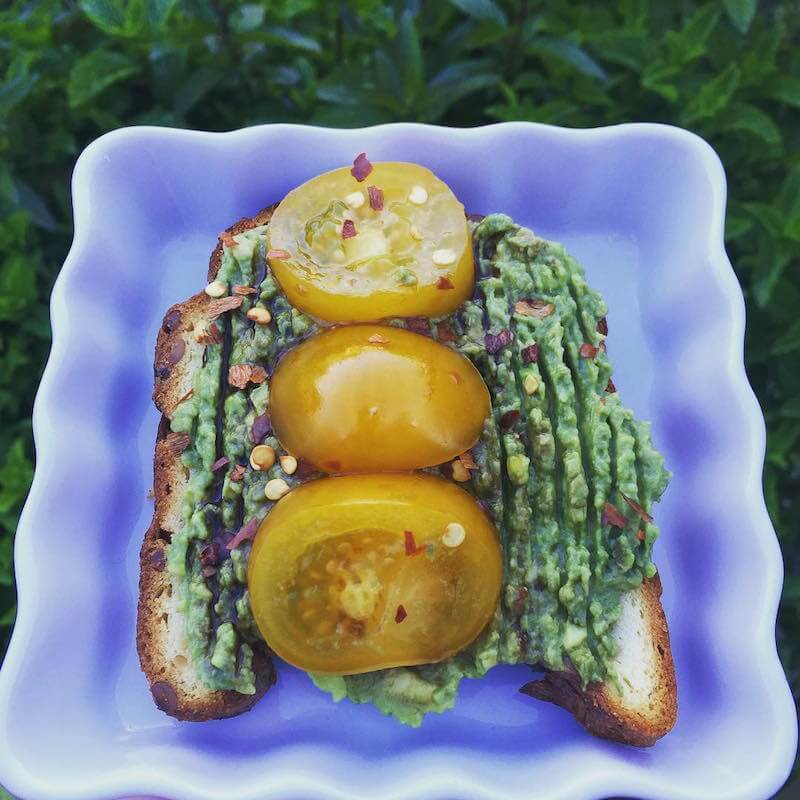 Our friends at Nature’s Path have one more avocado toast idea to get you fueled up for the day. This one has a cruelty free “bacon” add on that you won’t want to miss. Toss together granola, olive oil, brown sugar, chili powder, garlic powder and onion powder. Transfer to parchment paper–lined baking sheet; bake for 10 to 12 minutes or until mixture is fragrant and golden. Let cool completely. 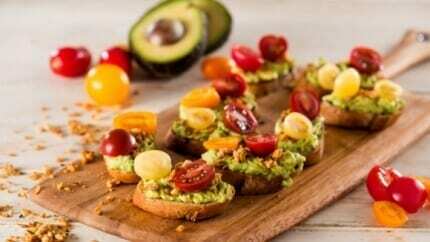 Mash together avocados, lime juice, salt and pepper; spread evenly over toast and top with tomato halves. Sprinkle 2 tbsp Pumpkin-Flax “Bacon” over each toast. Sprinkle over salads and soups if desired. So there you have it, 39 amazing healthy office breakfast ideas that will help fuel a focused and productive day. What are your favorite ideas? Share with us in the comments below. Awesome post! I’m hungry just looking at great photos! Num. Num. Love all these recipes! Will be forwarding to the team!! Yum, thank you for all these great recipe ideas! Sometimes it’s hard not knowing what to put together to create a healthy yet delicious meal! I will definitely be trying a few of these! Wow! these are some great ideas! We love the Bounce Bars!! Terrific post! Thanks for the recipes. I love the blueberry oatmeal cups. Yummmm-meeee! Love this – never heard of many of these – I am excited to try! So many delicious ideas and gluten-free options! THANKS! 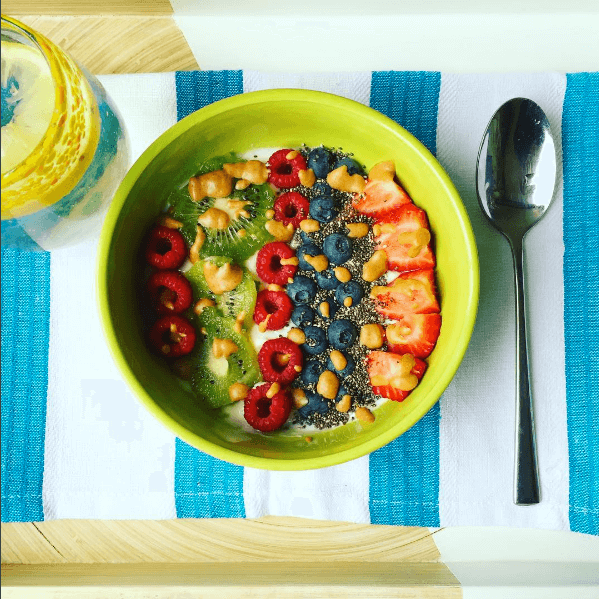 Always looking for great ideas that I can make the night before and grab on the way out the door – the chia pudding looks delish! Thanks, Erin! It’s pretty amazing. Let us know how you enjoy it! Definitely – the more you can do the night before, the better. That’s why we like the grab and go options like Bounce Balls and Thunderbird Bars. My office generally sticks to cereal, oatmeal, or a peanut butter and jelly sandwich for breakfast, but these ideas look easy and delicious! Avocado toast, muesli, and the french toast in a mug are all things you can make in the office! I usually have oatmeal every morning, but these are great ideas! Thanks, Jeanne! Hopefully there are a few ideas in here to make your morning oatmeal more interesting. 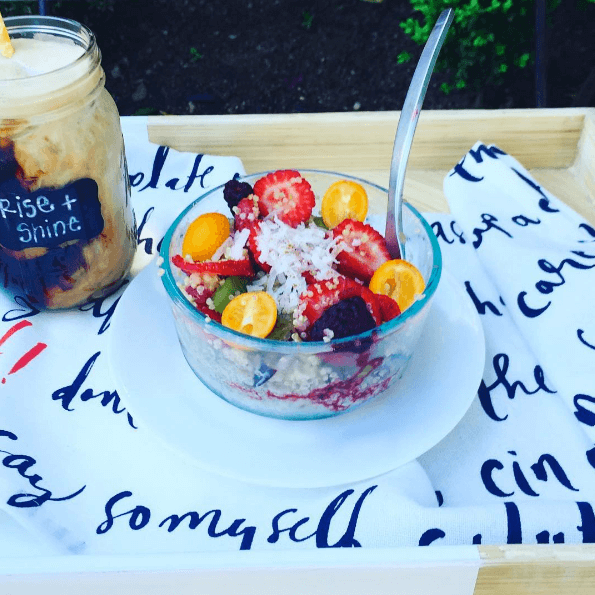 Love overnight oats with chia added and smoothies! I love Avocado toast in the morning!!! BEST breakfast ever!! It really is amazing. Thanks, BreAnne! 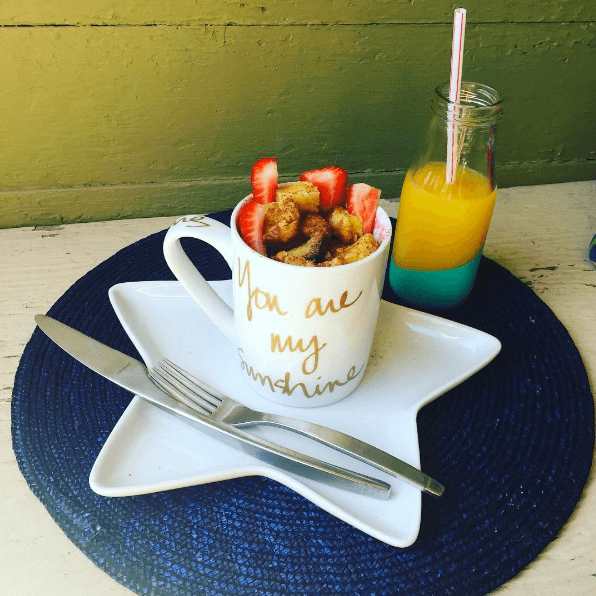 Amazing ideas for the amazing breakfasts! My goodness these look amazing. And most look easy enough to whip up. Thank you, Alice! Some take a little more prep, but most can be done the night before, before work, or even in the office. So many creative ideas! Love that we already have a few of these options here thanks to our breakfast box!! Some really great ideas here. I’m always looking for interesting healthy breakfast ideas. Cant wait to try chia pudding! Paleo Carrot Cake Donuts? Count me in. Wow, I seriously need to up my breakfast game! I may never get the image of my brain being a 1970s AC unit out of my head. This is great! I’m bad about eating breakfast every day, but these look healthy and delicious as well as fairly easy to make. I’m definitely going to try out some of these recipes to shake up my normal routine! Thanks for the great post! I’m typically a picky eater, but a lot of these definitely look and sound delicious enough to try! I have a really hard time making time to prepare breakfast…. but these recipes look pretty easy and the end results look like something worthy of 15 mins less sleep! I already make a smoothie to accompany my breakfast but would be super into trying the tropical smoothie bowl. For sure! It’s a good one. I’m going to try a couple of those recipes. My quick and healthy breakfast – nonfat yogurt, berries, protein powder, nonfat milk, and ice. Blend it up for a yummy smoothie on the go. Yum! The Pumpkin Spiced Baked Oatmeal looks delish and would be a great treat for the office in the morning. Couldn’t agree more! Once you make a simple mindset change, your habits will change, and you’ll start to reap the benefits. In fact, you’ll wish you’d started sooner! These recipes look amazing, I plan to definitely try a few of them. I do get bored with my same old oatmeal and grapefruit! Love the Bounce Balls – have been enjoying this in our box delivery! Awesome! Glad you enjoy them. We have all the ingredients to make overnight oats in our office… the hard part is remembering to do it before you leave the office! So many yummy ideas, definitely love all these healthy options (gluten free too!) – great post!! Thank you, Kayla! Glad you got some value out of this. Everything looks delicious… I’m thinking it’s breakfast for dinner tonight!!! Can’t wait to try some of these recipes. 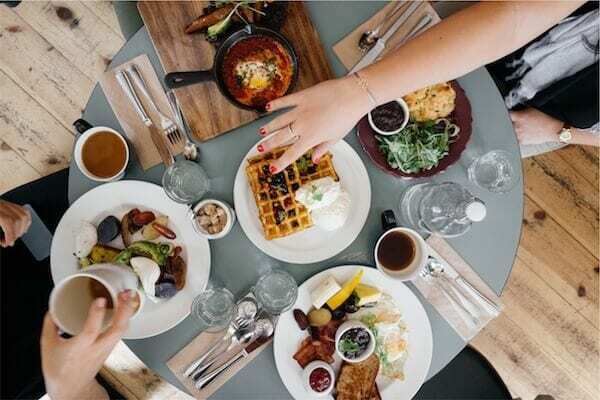 We think breakfast time is more a “state of mind” than an actual time of day… wouldn’t you agree?? Unfortunately, I’m on the slow-card diet, so all of these fruits and carbs are a no-no. Protein and legumes with some spinach are my go-to for now! Pinning these for cheat day, though! Chia chia chia, put that stuff on everything! I will try most of these! Chia seeds are the best! I can’t wait to try the recipe you posted. Chia seeds are also great in lemon infused water. yum! The craziest is for sure the eggs with oats–I’m going to have to try it out! Going to share these on our Kitchen channel on Slack! Thank you! I always struggle with breakfast ideas! I will have to try some of these out!! Wow!. These breakfast are awesome. They look delicious! I love to try it myself. Thanks for sharing Jeff! I can’t decide which breakfast dish I like best. Between the Cherry Tomato Avocado Toast, Mayan Brekkie Bake, Paleo Carrot Cake Donuts, Strawberry French Toast in a Mug, Tropical Green Smoothie Bowl, and Pumpkin Spice Baked Oatmeal, I can NOT decide which one to try first. They all look so pretty that I may be too afraid to mess them up by eating them, although I’m sure I wouldn’t be able to resist having a taste (or demolishing the entire plate). Now, if only I can find the extra time to make breakfast in the morning.. Most of these look good. I love fruit so I would like to try the Frozen Banana and Peanut Butter Smoothie, Berry Chia Parfait, Raw Buckwheat and Blueberry Porridge, Breakfast Banana Split, Tropical Green Smoothie Bowl, Coconut Crepes with Lime Sugar and Yogurt, Berry Coconut Breakfast Smoothie Bowls, Gluten Free Strawberry French Toast in a Mug. There is so much to try! Thanks for these awesome ideas! So many delicious breakfast options. Loves this! great ideas! Love overnight oats and avocado toast. Quick options that are both healthy & filling. These are all great ideas! I’m horrible at eating breakfast. So these quick options may be my solution. These are great ideas. I cant wait to try the broiled grapefruit. Grapefruit is my favorite but never tried this recipe. I love chia seeds so will definitely try the pudding. Lots of other appetizing recipes too! What awesome ideas! So easy and delicious! Just reading this post made me hungry. Cant wait to try these! Too many of my friends/colleagues skip breakfast daily. The peanut butter waffle is my favorite! We encourage our employees to post on our employee website and company bulletin board ideas – Now they have started sharing their food like a buffet to encourage healthy eating. Some of these look tasty! I am very thankful our office break room has a full kitchen! Love these recipes…tried many of them. Yummy and good for you. I’m a health kick for the new year, so these recipes are great. I like #15 the best.